Although we mainly see kids for hearing loss due to fluid in the ears, chronic ear infections, or eustachian tube dysfunction, every so often, a child will show up with the exact opposite problem. 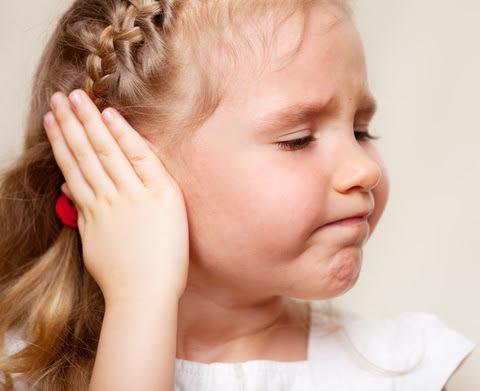 The child hears just fine, but suffers from noise hypersensitivity, also known as auditory hypersensitivity. Such children are overwhelmed from everyday noises whether doorbells, sirens, key clanking, etc; typically high-pitched sounds. The hands will go over the ears in an attempt to dampen the sound and may even become tearful. This phenomenon is not uncommon in kids with developmental delays, autism, central auditory processing disorders (CAPD), Down's syndrome, etc. But "normal" kids may suffer from this condition as well. Before going into treatment, one first needs to understand how sound is perceived first. Human hearing is a complex listening device composed of not just the ability to "hear" the sound, but also to "comprehend" the sound. Disorders like CAPD is analogous to dyslexia where the patient can "hear" sounds perfectly normally, but has trouble understanding what they hear. As a child develops, the auditory neural pathways in the brain that govern the comprehension of sounds are either reinforced or dampened down with time. For example, auditory neural pathways that allow for speech comprehension are reinforced whereas neural pathways perceiving background noises and other random sounds are dampened with time. In auditory hypersensitivity, for whatever reason, the auditory neural pathways governing the perception of certain miscellaneous noise like sirens or doorbell are reinforced causing the perception of the sound to be more significant and tremendous than it should be. In a normal child without sensitivity, such pathways are suppressed. To use an analogy, consider the auditory neural pathway like the road system in the United States. Over time, certain roads like the interstate highway is "reinforced" leading to more drivers using such streets to get from point A to point B far more quickly than if they used local roads. Problems occur if for some reason, cars avoid the highways and local roads are taken preferentially leading to traffic jams and irate drivers. Auditory hypersensitivity is kind of like that... local roads being "reinforced" when it should be suppressed. So what can be done to treat this frustrating condition? In essence, therapy is geared towards reinforcing good auditory neural pathways and suppressing the bad ones that lead to noise hypersensitivity. Such therapy programs include listening to special music and ear training exercises. One such program is "The Listening Program". But one thing is clear... keeping someone with noise sensitivity in silence is the worst thing that can be done. It just reinforces the bad pathways! Hyperacusis in children: A clinical profile. Int J Pediatr Otorhinolaryngol. 2018 Apr;107:80-85. doi: 10.1016/j.ijporl.2018.01.004. Epub 2018 Jan 31.